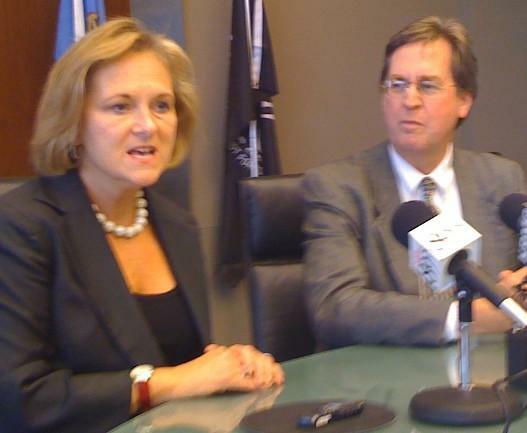 Former Mayor Taylor and Current Mayor Bartlett at a joint news conference in 2009. Former Tulsa Mayor Kathy Taylor is re-entering politics. She has announced she will seek her old office on the 15th floor of City Hall. She will challenge incumbent Mayor Dewey Bartlett, Junior. Former City Councilor Bill Christiansen has also announced plans to enter the race. Taylor served as Tulsa’s Mayor from 2006-through-2009. She did not seek re-election in 2009, saying at the time, she needed to focus on the pending economic crisis rather than run a campaign. As Mayor, Taylor oversaw completion of the BOK arena, the creation of a downtown baseball park and the move of City Hall to the One Technology Center. Since leaving office, she was involved in then Governor Henry’s efforts to get a federal ‘Race to the Top’ grant for Oklahoma. Those efforts were not successful. She also had a fellowship to Harvard University and has been involved in her family Foundation’s community work.